Being is a good listener is half of being a good speaker. Americans spend 80% of their waking hours communicating. We spend 45% of the time listening, but we only listen at about 25% of our ability to do so. In order to listen you have to stop talking. Listen actively. You can hear someone without really listening to them. Don’t get ahead of the person talking. Wait. Don’t jump to conclusions. Listen to them without turning their story into your story. Don’t finish other people’s sentences. Be patient and do not interrupt. Become a student of human behavior. Observe their nonverbal language. When appropriate, summarize to show you were actually listening. When tending injured athletes, care providers must pay attention to details that affect decisions. 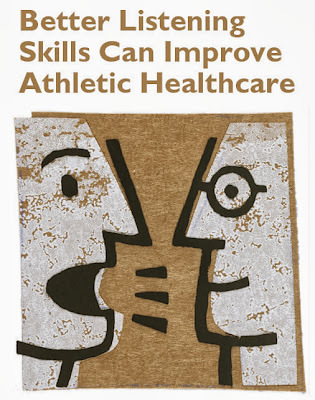 Asking and listening are key evaluative tools used by all health care providers. Injured athletes need to feel comfortable and reassured by the person who is caring for them. Powerful body language, positive facial expression, eye contact and professional verbal skills are trademarks of successful people in all walks of life. 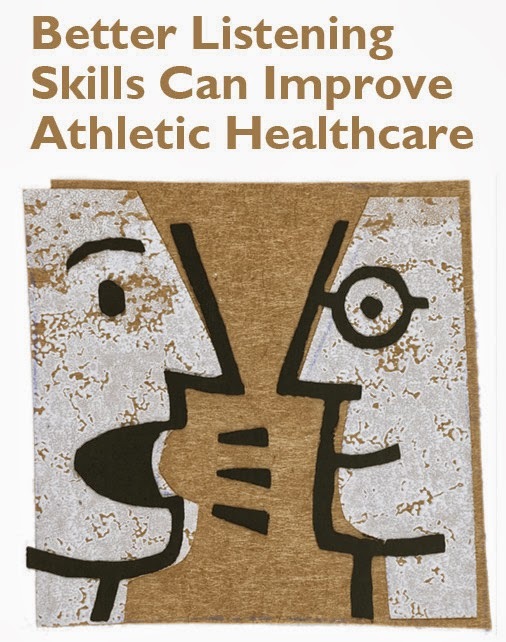 This is especially true in the emotional, fast paced world of athletic healthcare.